Farm co-ops connect Amish growers with urban markets they’d otherwise have challenges reaching by themselves. The Washington Post has a story on a co-op located in Franklin County, Pennsylvania called Path Valley Farms. The operation’s 20 Amish farmers provide produce for over 50 Washington, D.C. restaurants – items like heirloom tomatoes, horseradish, squash, and watercress. So how do low-tech Amish farmers coordinate, market and deliver their produce to the capital, located about 2 hours away? Grower Inheritance System – Farmer specialize in specific types of produce – if you grew something the previous year, you have the rights to grow it the following year. Or, you can pass those rights on another family of your choosing. Finances – 30% of revenue covers the co-op’s operational costs (buying new equipment, etc). The rest is for the farmers. English Help – With these types of ventures at least a few non-Amish necessarily need to be involved. Path Valley has a few English employees who manage communications with clients and drive the delivery truck. 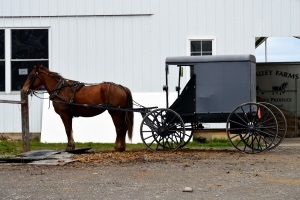 Preserving a Low-tech Approach– In comparison with places like Lancaster County, the Amish here have a plainer and lower-tech approach. They use ice harvested from a pond in an icehouse for produce cooling. The delivery truck displays no phone number. Farmers Deliver (and market themselves) – Amish farmers actually go along on delivery trips, which doubles as a sort of live marketing. Seeing a plainly-dressed Amish farmer on the premises no doubt gets attention and adds to the experience. Word-of-mouth generates business and chefs appreciate direct contact with the people who actually grow their food. Amish businesses need to be creative to reach their markets, while maintaining the boundaries delineated by their church and traditions. Co-ops are one way Amish are getting their produce into places they’d otherwise have trouble doing individually. Another, larger and somewhat more sophisticated example is Lancaster Farm Fresh Co-op, whose produce finds its way to East Coast urban areas including NYC. “It’s been our heritage to think that way,” her husband added. Small local farmers in my area (though not Amish) do the same thing, supplying everything from herbs to eggs, corn, beef, pork, chicken, flowers, etc. to local restaurants and markets. It’s called, I believe, the “farm to table” trend of supply & demand. Seems logical…hopefully, it’s healthier, although I sometimes wonder about chemicals left in the soil from decades ago (or illegal dumping of chemicals, etc., going on today). Nice to know the Amish are able to make a living by remaining on the family farm. I read previously that there are less Amish farmers than before, and that more are leaving to industry, service, and small business. I think that isn’t really true. Maybe as a percentage there are less Amish farming, but as a whole there are more Amish farming today than in the 1980s or 1950s. The growth of the Amish population means that not all of them can become farmers, but many Amish, especially the more conservative ones are buying up farm land all over the place. They’re buying up farms in NY, Maine, Kentucky, etc. So they’re doing fairly well as farmers and growing as farmers.